Today is July 16th, 2016. Today is the feast of our lady of Mount Carmel. I am writing first time for bulletin. I gave away scapular this morning to regular church coming persons. Many were asking what is the use of it. A scapular is part of a monk’s or nun’s habit: a strip of fabric protecting back and front of their habit. A hole is inserted in the middle so that it could hang over the shoulders. It got its name precisely from the Latin scapula, meaning ‘shoulder.’ It came to symbolize the gentle yoke of Christ. Third Order members (fifteenth century) were required to wear the scapular. Since they were lay people living in the world and did not wear a habit, the scapular was reduced in size, and eventually miniaturized (sixteenth century). It is made up of two small double squares of cloth (sometimes only one) of two-three inches square, suspended from the shoulders by two strings. It is usually the same color as the habit of the congregation the Third Order members (lay people affiliated to religious orders) belong to. 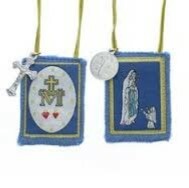 The scapular has the image of Our Lady or a symbol or aspect of the particular devotion it recalls. Scapulars are sacramentals giving the wearer God’s protection through the intercession–in the name and merits of Christ–of the church and its Saints. "The sign of the Scapular points to an effective synthesis of Marian spirituality, … Therefore two truths are evoked by the sign of the Scapular: on the one hand, the constant protection of the Blessed Virgin, not only on one’s life’s journey, but also at the moment of passing into the fullness of eternal life; on the other, the awareness that devotion to her cannot be limited to prayers and tributes in her honor on certain occasions, but must become a ‘habit’. I have worn the Scapular over my heart for a long time! Out of love for our common heavenly Mother, whose protection I constantly experience." If you need a scapular, please feel free to get in touch with me. It is absolutely free!!!! Please do not forget to be a part of CCD and RCIA for this year. We are preparing for a new exciting year. Let us become missionaries in our church. How can I complete my writing without sports? 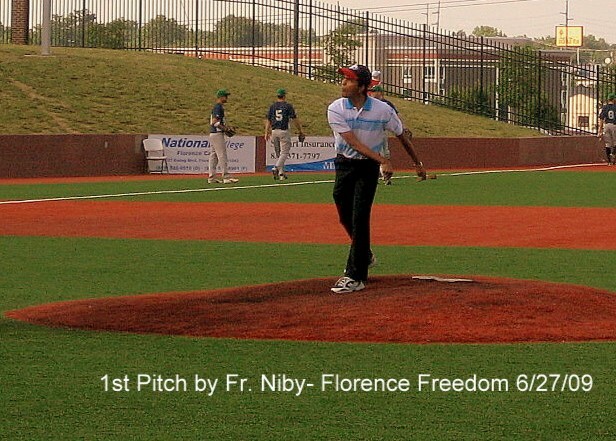 I pitched in Florence Freedom games two times (Opening Pitch)! Our Bishop’s bobblehead give away is August 5th at Florence Freedom’s Catholic Faith Night. Do not forget to come and say “Hi” to Bishop Foys. Looking forward to having an exciting academic year!